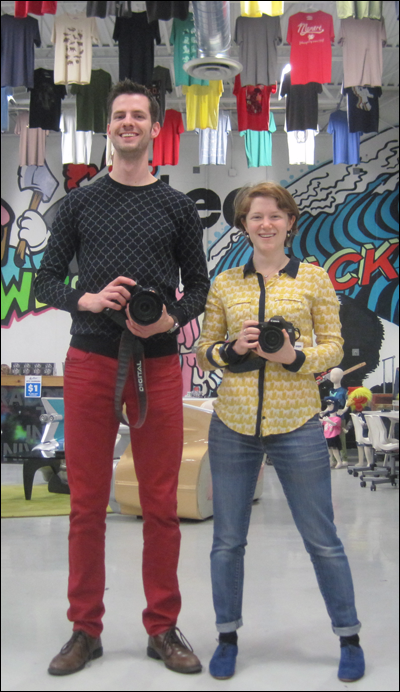 Photographers Keith Mandley and Stephanie Strauss at 40th monthly CreativeMornings/Chicago gathering. View more of my photos. Since CreativeMornings’ debut in Chicago during the summer of 2011, my interest in going to design-related gatherings wasn’t just renewed—it was re-invigorated. As I’ve stated regularly (here and there), CreativeMornings is my kind of conference—a free monthly breakfast lecture series. Attendees indulge in catered treats, listen to a talk, then return to work, spiked with an informed perspective about creativity. It’s easy to take for granted that CreativeMornings is run on raw human power. Human energy and time are precious natural resources, and they’re well-utilized at CreativeMornings on a monthly basis. I’m grateful that a CreativeMornings chapter is accessible in Chicago. These are the people—using their energy and time beyond their full-time jobs—who make the Chicago chapter’s continual range of gatherings happen for the locally curious, including out-of-towners, representing many creative disciplines. Knoed Creative: Kim Knoll and Kyle Eertmoed. View more of my photos. Every month, several decisions must be made: where CreativeMornings/Chicago is held, who is sponsoring the event (that breakfast spread isn’t vapor), and who’s presenting, among others. These are matters that Kim Knoll, co-founder of Knoed Creative, addresses year-round. 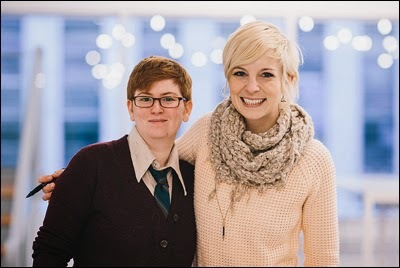 She took responsibilities for owning the operations of CreativeMornings/Chicago in January 2013 and ensures that the Chicago chapter takes place, as expected, each month. Photographer Chris Gallevo. Photograph by Matt Soria. View more. Videographer Ben Derico. Photograph by Matt Soria. View more. There’s a living record of each Chicago chapter’s gathering. Photographer Chris Gallevo is the event’s regular photojournalist. At times, other digital photographers pitch in, like Neftali Morales, Matt Soria, and Drew Rios. To complement the photography, videographers Ben Derico, Erick De La Rosa, and Steve Delahoyde record, edit, and post the filmed account of each talk. Ben is also working on a new video series called “CreativeMornings Chicago: Close Ups,” where he interviews the speakers in a focused format. Without documentation, there is no official recall of what was shared. Each chapter’s talk is duly documented, comprising a motivational pool to dip into, whenever you feel an educational reprieve is needed, for anyone with a connection to the Web. Volunteers Liz Cook and Joy Burke. Photograph by Drew Rios. View more. 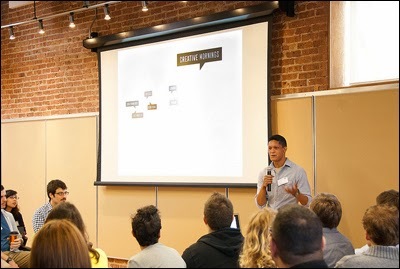 Photographer Drew Rios with former Volunteer Geremy Mumenthaler now at CreativeMornings/San Francisco. View more of my photos. Upon arrival to where a CreativeMornings/Chicago gathering is held, you encounter some of the friendly faces of the chapter’s team. This welcoming gesture, whether it’s extended at the front door, during check-in or the talk, is regularly provided by Joy Burke, Geremy Mumenthaler, Liz Cook, Kyle Newton, and Martha Willis. On the day of turn out, Kyle Eertmoed facilitates tasks and orchestrates a smoothly executed event. At every gathering of CreativeMornings/Chicago, there is a gradual accumulation of attendees, who signed up to join a diverse community, composed of several creative frontiers. The atmosphere of the venue thickens in smiles and conversations, then mindful silence to fix attention on the speaker’s presentation. Applause. Warm farewells. In a span of an hour and an half, an experience of shared enthusiasm unfolds. It’s a tiny experience, considering how quickly it transpires, but lingers and carries on, in large subtle ways, until the next time CreativeMornings/Chicago convenes for a generous serving of local perspective, to help guide thoughtful living. To echo my tweet, I salute each of you who selflessly make and manage CreativeMornings—by way of hosts, speakers, partners, and other important means—in your respective city! 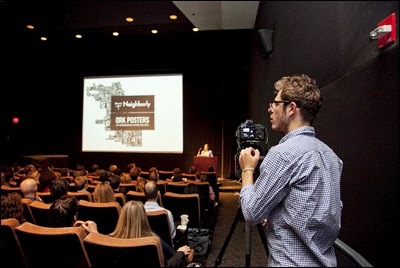 Mig Reyes at first gathering of CreativeMornings chapter in Chicago. Photograph by Chris Gallevo. View more. 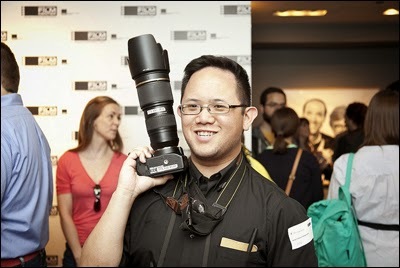 Big thanks: to Mig Reyes who established the Chicago chapter of CreativeMornings in June 2011. 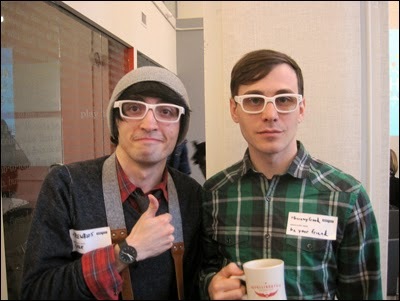 His scouting for the best folks to pass on ownership of CreativeMornings/Chicago, then granting it (January 2013) to Kim and Kyle, of Knoed Creative, was the precisely right move to make. Under their coordination, the frequency and presence of CreativeMornings in Chicago has substantially improved. 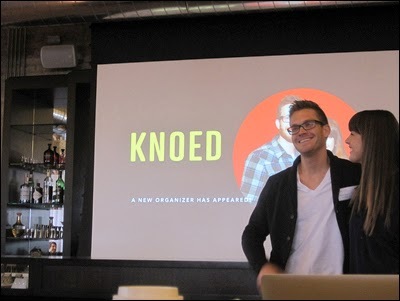 Knoed Creative’s Kim Knoll and Kyle Eertmoed spoke at the 7th monthly gathering (January 2012) of CreativeMornings/Chicago. Read my recap and more coverage of design-related events. My coverage: read more write-ups about Chicago CreativeMornings and view more photos of CreativeMornings in Chicago. If you liked this lovingly-made reflection, show your appreciation by helping to support my labor of love—Design Feast, which proudly includes this blog. Learn more.